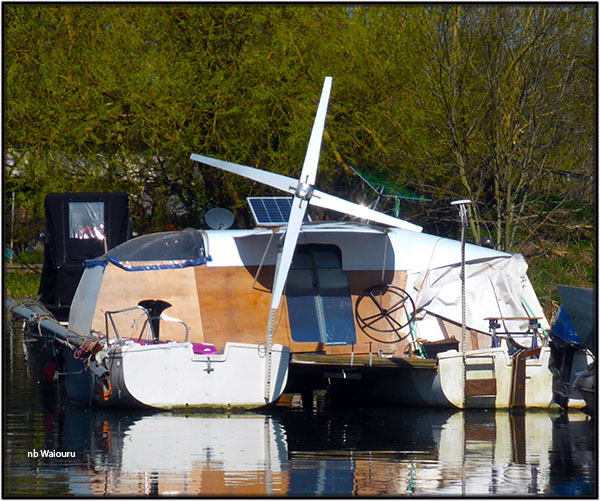 It was a short cruise from Hoddesdon to Ware. 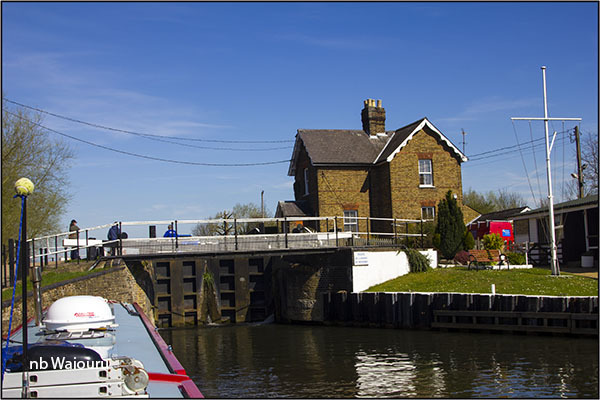 The advice we received regarding the fierce flow in Stanstead and Hardmead Locks was most useful and we went through each using only one paddle. A wide beam CRT working boat was ahead of us and when it was our turn one of the local boaters with a mooring in the adjacent marina wandered across to have a chat. He was quite agitated about the number of unlicensed boats in the area and the way they sat on all the good moorings. 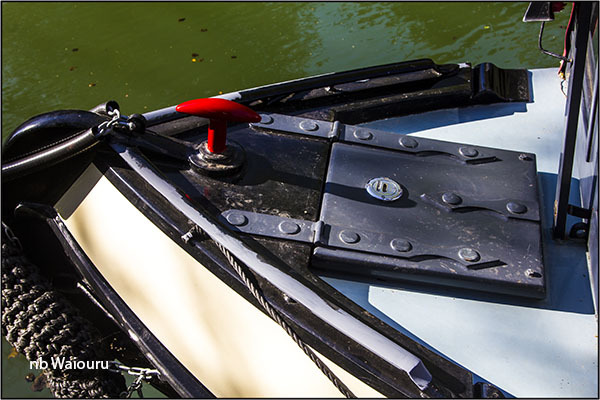 We have noticed a number of boats not displaying a license, boat index number and name. It must make license enforcement difficult. 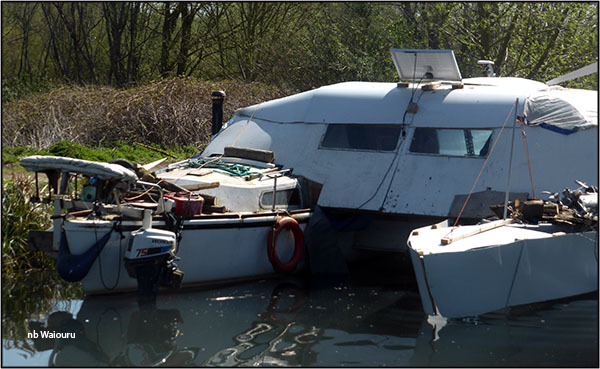 However the boater went on to say they now had a new CRT enforcement officer who seems to be getting “them” moving on. 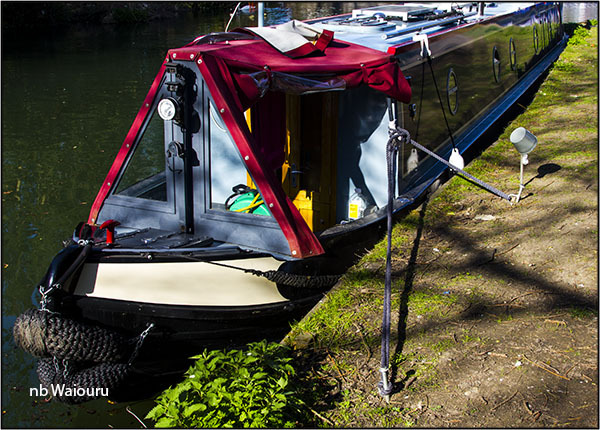 There was an interesting moored boat on the southern side of Ware. The first thing we noticed were the rotating large blades on the stern mounted wind turbine. Then we realised it was a catamaran. It’s obviously too wide to fit through the locks. So how did it get here? Things became more apparent as we passed. A platform has been constructed between a small tupperware boat and a dingy with an extended bow. It’s obviously a home rather than a vessel intended for cruising the network. 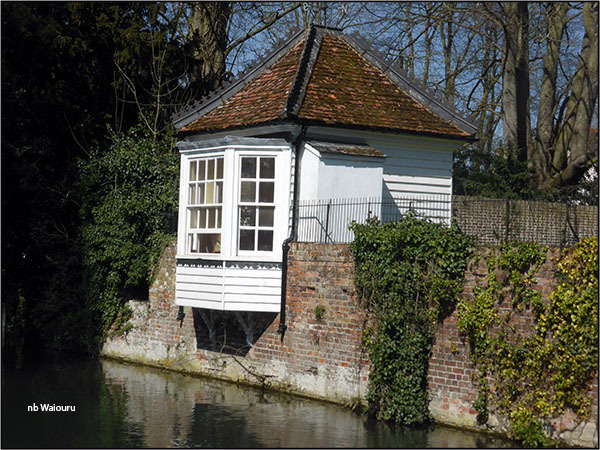 Amongst other things, Ware is famous for it’s 18th century riverside gazebos. There are a number of other interesting buildings in the town. 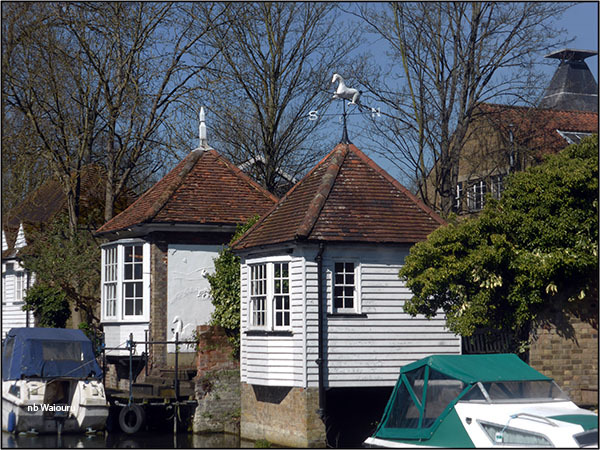 One that is noticeable from the river is this building with a steeply pitched roof with the platform on top. That will need to be explored tomorrow, along with the nearby priory. My initial thoughts are that this might be some type of pigeon roost? 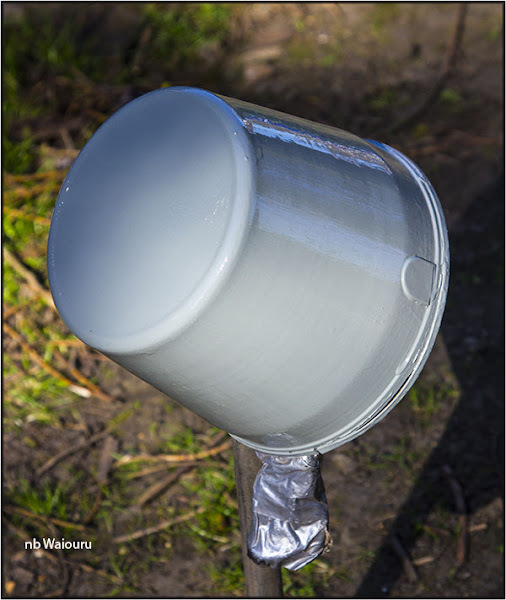 This afternoon I made a start on the task I most dislike…… exterior repainting. There is a spot on the roof between the solar panels where I noticed bare metal whilst washing the other day. I’m using the technique explained to me by Darren when he painted Waiouru. The affected area is masked on all sides. This results in the finish being in a defined area. First coat of primer. Two undercoats and two topcoats to go! I’m not that happy with the end result but will wait until it has dried before making a decision whether to do it again. The bow ‘T’ anchor point hasn’t been repainted since Waiouru was put in the water. It was rubbed back and given an undercoat and top coat. As you can see in the above photo, I’ve also removed the rust off the rails and applied some primer. I needed to think of a way to secure the bow when painting this area and came up with a solution using the handrail in the cratch. 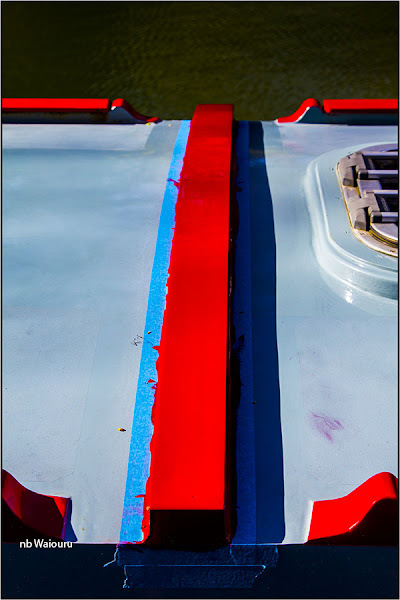 It will take some time for the red paint to harden which means we will probably be using this mooring technique for several days. 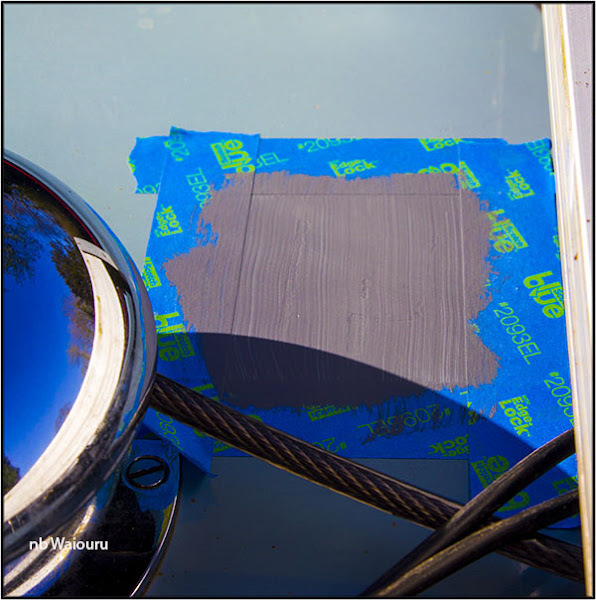 The last part to paint was the cap that covers the stove flue hole on the cabin roof in the summer. I’m a poor painter and consequentially hate doing it. 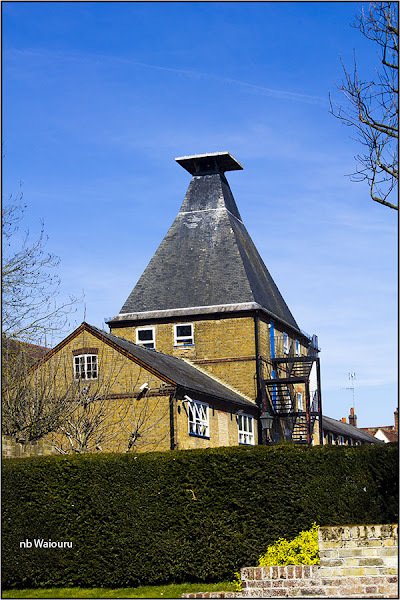 The building you refer to is a converted malting. 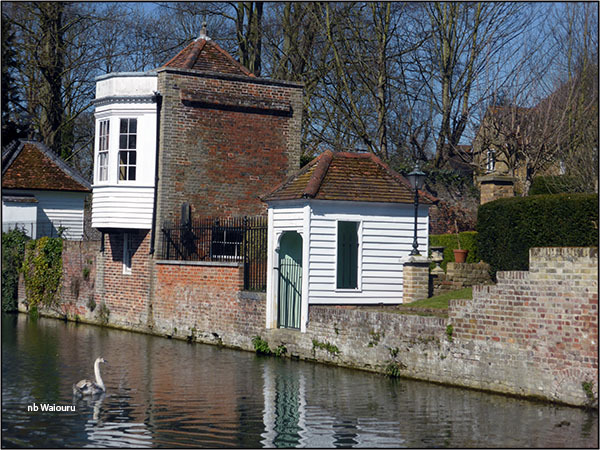 There are many such buildings in Ware, as it was a centre for malting grain. Outside the church, just over the High Street from your mooring, there is a statue to commemorate the men who worked in the industry.